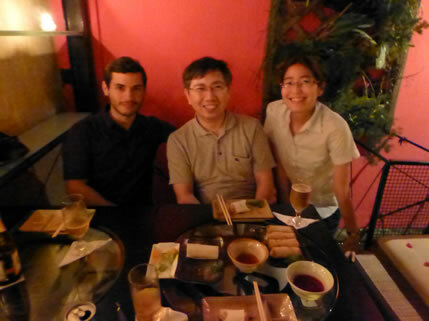 This is Marina Oikawa, PhD student (D3) at IMD Lab. 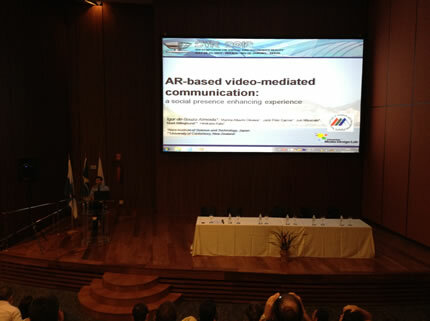 I, Igor Almeida (D2) and Prof. Kato participated in XIV Symposium on Virtual and Augmented Reality (SVR2012) in Niteroi (RJ), Brazil from May 28th-31st. 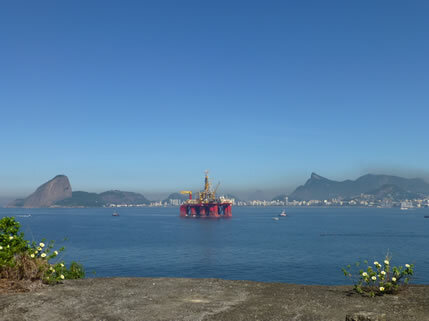 The event was held at Mercure Hotel, which has a nice view of the Guanabara Bay and from where you can also see the Sugar-loaf Mountain and the Christ Redeemer’s Statue, the two main touristic attractions of Rio de Janeiro. 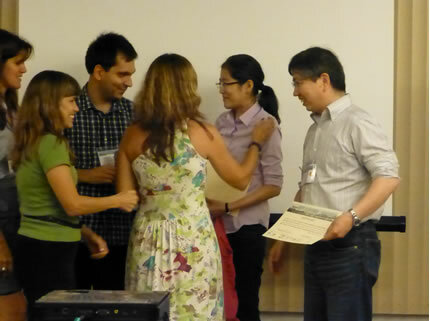 On the first day of the conference, there was a keynote talk by Assoc. 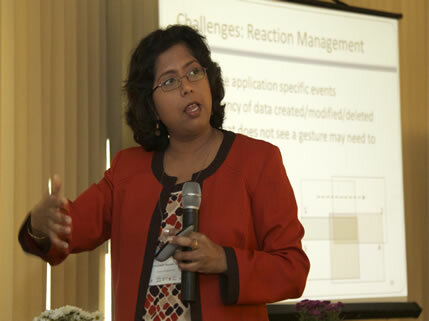 Prof. Aditi Majumder, from University of California. The main topic of her talk was about new degrees of freedom to next generation displays and cameras. 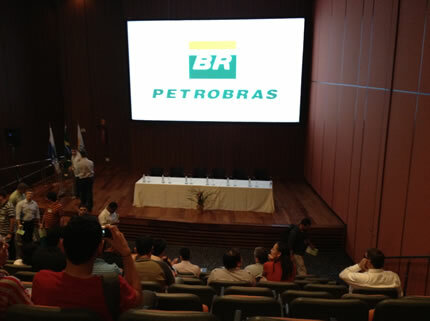 The rest of the day was filled with the technical session. Igor de Souza Almeida, Marina A. Oikawa, Jordi Carres Polo, Jun Miyazaki, Mark Billinghurst, Hirokazu Kato: “AR-based video-mediated communication“. 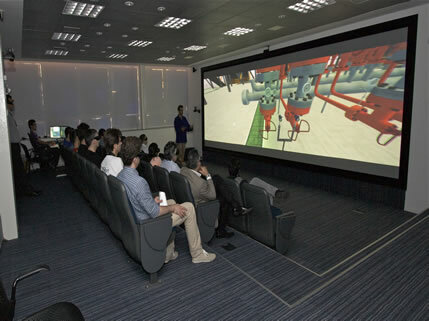 The demos we could see in the research center were basically related to virtual reality simulations for training, oil extraction and other simulations made to attend specific needs of the company. 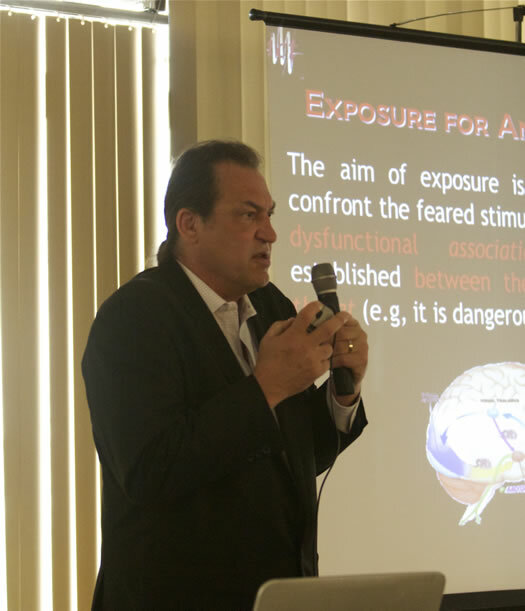 On the last day of the conference, Researcher Prof. Albert Rizzo, from University of Southern California, gave a keynote about Clinical Virtual Reality, focusing on VR systems that targets clinical assessment, treatment rehabilitation and resilience. 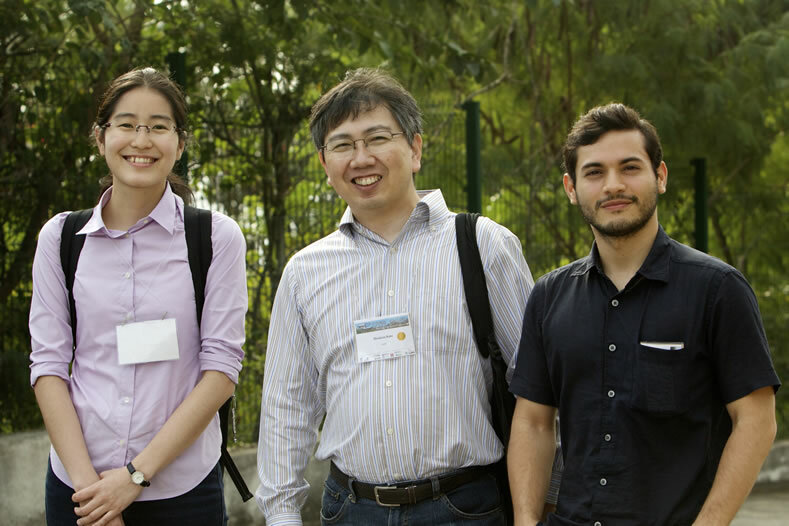 Marina A. Oikawa, Takafumi Taketomi, Goshiro Yamamoto, Makoto Fujisawa, Toshiyuki Amano, Jun Miyazaki, Hirokazu Kato: “Local quadrics surface approximation for real-time tracking of textureless 3D rigid curved objects“. 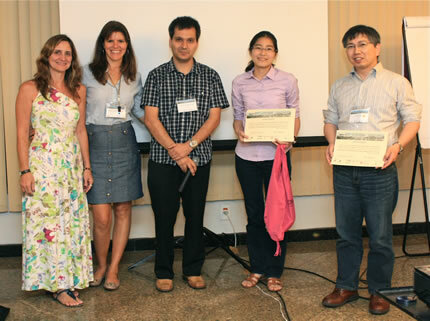 which got the Best Paper Award. Another paper getting an award in this conference was: Human Body Motion and Gestures Recognition Based on Checkpoints, by Thiago Chaves, Lucas Figueiredo, Alana Da Gama, Cristiano Araújo, Veronica Teichrieb, from Universidade Federal de Pernambuco (UFPE). Overall, I think it was a nice opportunity for us to exchange some ideas with other Brazilian researchers (the main public in the conference), have an idea of research institutes and companies in Brazil working in the AR/VR field and also get our work known by them. 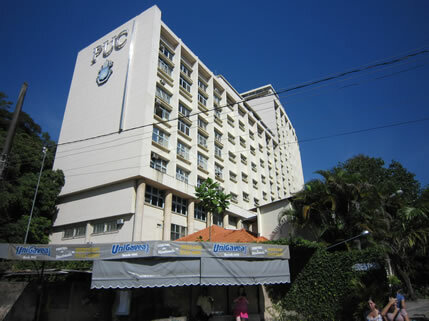 During our stay in RJ, we also visited two Laboratories: VISGRAF, at IMPA (Instituto Nacional de Matematica Pura e Aplicada) and Tecgraf at PUC – RJ (Pontifícia Universidade Católica do Rio de Janeiro). 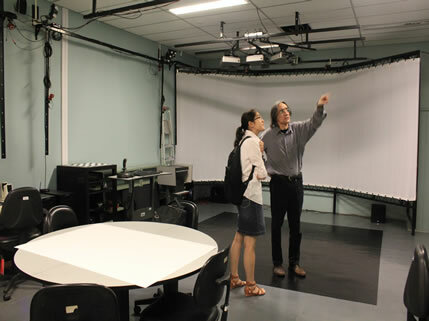 Both have researches related to Computer Graphics, Computer Vision and AR/VR technologies. We had the chance to discuss our researches with the Professors in these institutes and get some nice feedback from them. 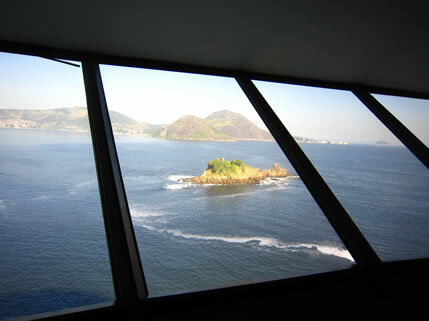 The conference was held in a city called Niteroi,which is connected to the city of Rio de Janeiro by a 13.29km bridge. It is also possible to reach the city by ferry. 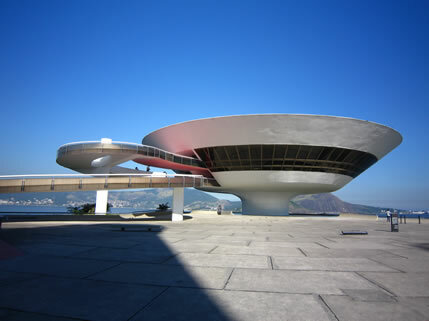 In Niteroi, we visited the Contemporary Art Museum (MAC), designed by a famous Brazilian architect, Oscar Niemeyer. 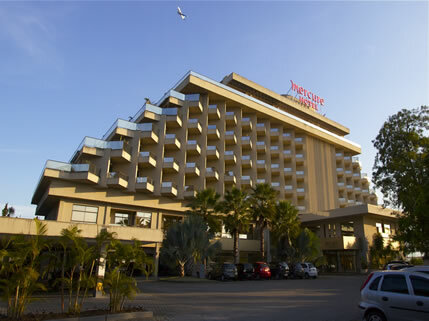 It was located just 200 meters from the conference site. 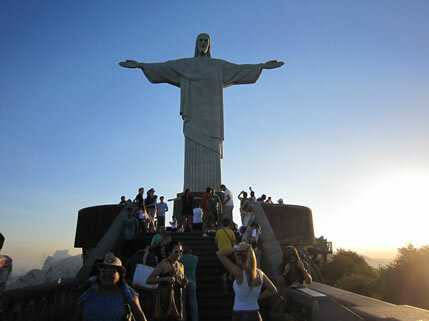 We also visited one of the most famous touristic points in RJ: the Christ Redeemer’s Statue. 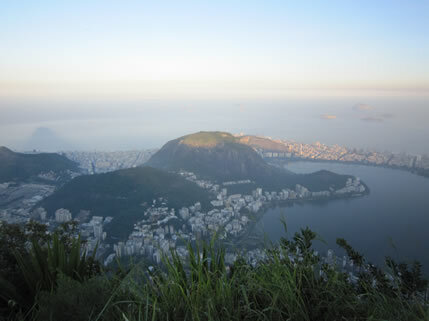 It is located at the peak of the 700-metre Corcovado mountain in the Tijuca Forest National Park, overlooking the city. Most of the pictures I used in this post were taken by us, but some of them were taken by the organizers of the event. They made it available in this link. 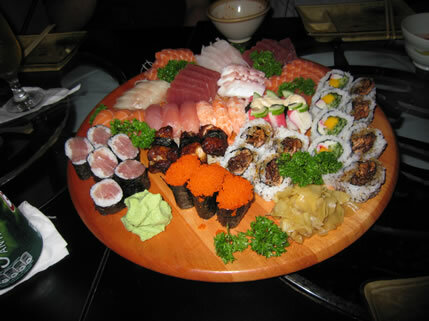 This entry was posted in Uncategorized on June 25, 2012 by .